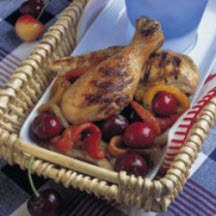 CooksRecipes has quality, kitchen-tested recipes for salads featuring peppers, such as bell peppers, piquillos and poblano peppers, as the main ingredient. A delightful presentation! 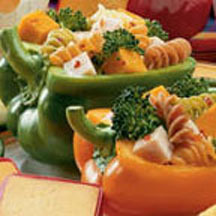 Colorful bell pepper "pots" are filled with a tasty turkey salad tossed with Italian dressing. 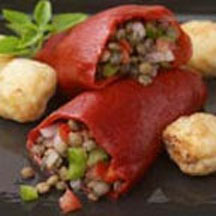 Piquillo—Spanish for "little beak"—peppers are stuffed with a lentil salad and served with crisp, blue cheese "croutons". A delicious grilled sweet pepper and onion salad with plump sweet cherries, dressed with a balsamic vinaigrette and fresh basil.